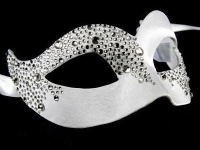 Truly eye catching, the Amare Designer Mask is a new twist on a traditional theme. Wear the Amare and you’ll create a lasting impression at your special occasion themed party or masked ball. A true carnival masquerade mask, the Amare Designer Venetian is one of a kind. One striking characteristic gives it that difference. It can be full face – or it can be half face. And how should you wear it? If it’s impossible to decide, there’s no need. Choose both for a double touch of appeal. Change your mind and change your masquerade style in an instant. Flip the mask, re-tie it in place and keep everyone guessing. You can create your costume around the Amare, or opt for plain and simple making the mask your statement piece. The luxury Amare Venetian masquerade mask has been made by hand using the papier mache technique. This quality of craftsmanship is found only in the Venetian hand made, never in the mass produced versions. Take a closer look at the red painted patterning around the eye or on the gold painted lips and you’ll see the fine brush strokes that tell you this mask has been made by hand and not by machine. The first masks made in medieval Venice were simply decorated and designed to be practical. Then came the Carnival and with it the chance to show off. Designs became more and more elaborate, the Carnival season extended every year until in the 18th century everyone wore a mask, whether carnival time or not. Nobles who wished they weren’t would don a mask to avoid the social constraints of everyday life. Now it’s your party and your time to be different. Make this mask your own and show off a new style at your next celebration. The Amare will be delivered free to your home.